ProMix S | ProMinent Fluid Controls, Inc. The ProMinent ProMix™ is a pre-engineered polymer mixing system made for the water and wastewater markets. 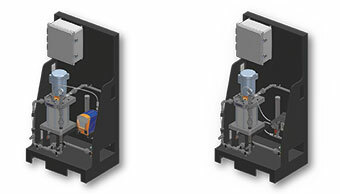 Designed as an in-line unit, the ProMix™ can be customized to meet most liquid polymer applications utilizing tubing or diaphragm pump technologies depending on the application requirement or customer preference. The unique mixing chamber allows for complete makedown of the neat or diluted polymer to guarantee a problem-free injection.